No Indian meal is complete without a generous treat of sweets that tickle the taste buds. A rich variety of sweets are prepared in the Indian households not only on special occasions like festivals and fairs but also to treat their guests. 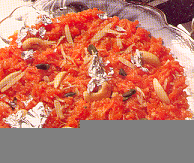 Most popular among the Indian sweets are the different types of Laddoos, halwas and syrup-based sweets. Mix butter and sugar till it is light and fluffy. Mix the dry ingredients and mix it with the batter slowly while stirring. Add the colors, kismis and milk and stir for some time. Pour the batter into a greased plate and cook on power 60 for 3 minutes at high mode. Take the carrot along with half the amount of sugar and cook covered on power 60 for 14 minutes. 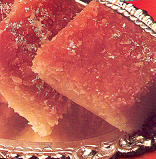 Add the condensed milk, khoya, and the rest of the sugar and cook uncovered for 8 minutes. Garnish with the cashews and currants and serve. Mix the butter and sugar well. Add all the dry ingredients and the cola drink and mix. Pour in a greased plate and cook on power 60 for 3 minutes at high. Allow it to stand for 5 minutes on the oven. Cool and slit the cake horizontally. In a bowl whip the cream and sandwich the two layers with the cream. 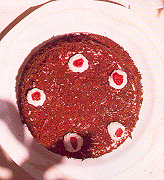 Top with the cherries and grated chocolates. In a dish take the ghee, semiya, cashews, raisins and cook on high for 4 minutes with stirring in between. To this add the milk, condensed milk, and cook on high for 3 minutes. Add the sugar and cardamoms and cook on medium power for 8 minutes till the kheer turns thick. Mix the yogurt, sugar, and oil and vanilla essence together. Sieve all the dry ingredients and mix to the batter. Add one tablespoon of milk and blend well. Cook on high for 11 minutes. Take some 50 Gms of the grated coconut and keep aside. Cool and roll into small laddoos with greased palms. Roll the laddoos in the coconut powder set aside and serve. This makes around 20 medium sized laddoos. Grind well the peeled almonds, elaichi and saunf to a fine paste and mix with the rest of the ingredients. This makes for 12 glasses. Heat the ghee in a vessel. Add the condensed milk, the milk and the citric acid dissolved in a little water to it. Stir well till the mixture curdles. Make a paste of the corn flour with two tablespoons of water and mix it with the above mixture. Slightly cool the mixture and shape into pedas. Serve garnished with elaichi powder. This would make some 20 normal sized pedas. Mash the panner coarsely and add the milk powder, condensed milk and mix well. Heat the above mixture in a thick-bottomed pan for about 10 minutes with constant stirring. Continue cooking till the mixture becomes thick. Remove from the fire and spread it on to a greased plate. Sprinkle elaichi powder on the top and also top it with the silver leaf. Cool it and cut into square pieces. 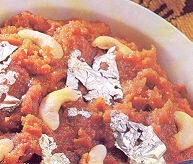 Add the kesari powder to the 2 cups water and add to the semolina. Then add the condensed milk and keep stirring till the mixture leaves the sides of the pan. Soak the gelatin in ½ cup water and dissolve in a pan of hot water. 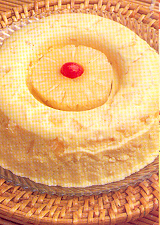 Mix the dissolved gelatin, condensed milk, chopped pineapple slices and lemon juice well. Whip the cream till it is stiff and add to the above mixture. Pour the mixture in a mold and refrigerate it for sometime. When set unfold it onto a dish and serve with beaten cream on top. Soak the figs in the milk for some one-hour. Heat the ghee in a pan and add the condensed milk and the fig paste and stir continuously till it leaves the sides of the pan. Dissolve the gelatin in half a cup of coconut water over a pan of hot water. Mix the condensed milk to the dissolved gelatin. Mix the above mixture with the tender coconut water and refrigerate it. 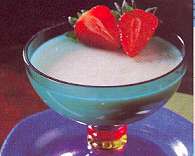 When set serve with cream or cherries and strawberries. Mix the condensed milk and milk and warm it over a pan of hot water. Mix the yeast and one or two tablespoons of maida and allow it to ferment for 30 minutes. Mix the salt, remaining maida, beaten egg and melted butter to the fermented yeast and stir well. Knead the dough well and cover it with a polythene sheet and allow it for 30 minutes. 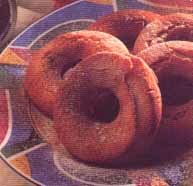 Then roll the dough into ¼ inch thickness and cut it into rings with a doughnut cutter. Deep fry this and roll it over sugar and cinnamon mixture and serve. Cook the carrots in ½ cup of water till tender. Add the condensed milk, ghee and corn flour. Cook this mixture till it leaves the sides of the pan. Remove form fire and spread over a greased pan. Cool and cut it into squares and garnish with the cashews. In a kadai, fry the semolina till it is brown. Add the ghee and roast for 10 minutes. Remove form the fire and make into small laddooos with greased palm. In a pan heat the ghee, add the maida and fry for a minute. Add the water mixing well and allow it to boil. Add the dates, condensed milk and cook well, till the mixture leaves the sides of the pan. Remove from fire and cool and cut into squares. Serve garnished with silver foils. Mix the milk and besan well and keep for about half an hour. Heat the ghee in a pan and roast the besan on slow flame for 12 minutes. Add the condensed milk and cook with constant stirring for 15 minutes till the mixture thickens. Remove from fire and place in a greased plate and garnish with the dry fruits. Cook the moong dal well till soft and mash it well. Heat the jaggery in one cup of water till it dissolves and strain it well. Grate the coconut and keep aside 2 tablespoons of it for final garnishing. Pour 1 cup of hot water over the coconut gratings and allow it for half an hour. Strain this to get one cup of thick milk. Again pour some 2 cups of hot water over the coconut gratings and keep for 15 minutes. Strain this to get 2 cups of thin coconut milk. 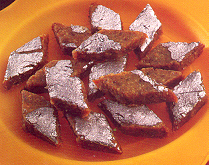 Mix the jaggery syrup, cooked moong and the thin milk and cook for 5 minutes with constant stirring. Add the condensed milk and stir well. Remove from the fire and add the one-cup of thick coconut milk. Add fried cashews and raisins to the payasam and top it with the grated coconut and elaichi powder and serve hot. 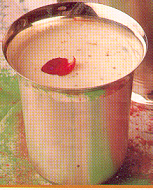 Heat the condensed milk, coconut powder, milk and milk powder in a thick-bottomed kadai. Once heated cook on slow flame till the mixture leaves the sides of the pan. Divide the mixture into two equal portions. Spread one portion evenly on a greased plate. To the other portion add the red color and mix well. Spread it over the white layer and allow it to cool.